Chapter 10. 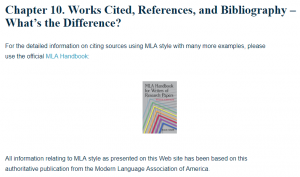 Works Cited, References, and Bibliography - What's the Difference? All information relating to MLA style as presented on this Web site has been based on this authoritative publication from the Modern Language Association of America. Works Cited is sometimes referred to as References. These terms mean the same thing. Each is an alphabetical list of works cited, or works to which you have made reference. Works Cited is generally used when citing sources using MLA (Modern Language Association) style, while the title References is used when citing sources using APA (American Psychological Association) style. MLA Works Cited and Bibliography are not the same. In Works Cited you only list items you have actually cited. In a Bibliography you list all of the material you have consulted in preparing your essay whether or not you have actually cited the work. Special info about MLA bibliography example. If the first word of the title is “The“, “A“, or “An“, and the word is being used as an article, e.g., in the title: The Little Book of Irish Clans, the entry is placed under “Little” and the article “The” is ignored. In the title: A Is for Apple, however, the entry is placed under A since A is used as a noun and not as an article in this case. Sometimes the article “The” is used as part of the name of a company or magazine or journal for emphasis, e.g., The Champ, or The Sports Network. For Internet sites, use the URL as a guide. If “theyellowpages” is used in the URL, treat “The” as part of the title, and list “The Yellow Pages” alphabetically under “The“. If “edge” and not “theedge” is used in the URL, list the magazine title “The Edge” under “Edge” and treat “The” as an article and ignore it. 3. Begin on a new page. Start on the 6th line from the top (or 1″ down from the top of the paper), center, and type one of the following titles: Works Cited, References, or Bibliography. Double space after the title. List all entries in alphabetical order by the first word, taking into consideration the rules governing titles that begin with articles. 4. Begin the first line of each entry flush at the left margin. Keep typing until you run out of room at the end of the line. Indent 5 spaces for second and subsequent lines of the same entry. Double-space all lines, both within and between entries. Remember that this is only a guideline adapted from the MLA Handbook. You are advised to follow the style preferred by your instructor. There is a mistake that students often tend to make. They name their reference page the Work Cited page, which is incorrect. The proper name for it should be Works Cited, as the works by multiple authors, not one, are cited. The Works Cited page is often used in the Humanities, the MLA Style and the APA Style. For help in proper formatting of your Bibliography, References, or Works Cited, have a look at this Useful Source.